In the early days of content marketing, the only option was Photoshop. Sure, it’s still a pretty solid gold standard, but it’s also expensive and hard for non-designers to use. As digital storytelling became more prevalent, the wise minds of the software world got to work making easy-to-use, web-based applications to remove barriers to creation. We at Cerkl have used a ton of free and premium tools for creating graphics. In May of 2016 Adobe made a big splash in the free editing apps market with their release of Adobe Spark. It brought together Spark Page, Spark Post, and Spark Video into one simple app that you can use on web and mobile. Yes, Adobe, yes. For more than a year, Adobe Spark was totally free. All you needed was an Adobe ID to get started and you were off and running. But as is the case with so many software solutions, the upgrade ask has come. There is still a free version of Spark available and that’s what I will be reviewing but if you want to get rid of that pesky watermark, it’s going to cost you $10 a month. Spark allows you to make web pages, still graphics, and quick videos. There are many free applications that specialize in graphics and landing page creation, but a free, web-based video editor is something special. Spark Video is quick, intuitive, and nearly impossible to mess up. It’s as simple as making a slide deck… but it moves. After signing in, use the plus sign at the top of the page to select what you want to create. Once you choose video, the program quickly loads and you are asked to title your project. Not sure what to call it? No worries! Spark Video doesn’t make you keep that title, and they let you move on even if you don’t name it. The whole thing is a playground of simplicity. After a quick loading page, your personal video sandbox is ready for you to play in. I like to start by selecting a theme. Spark recently updated their theme options, and I have to say I like the new, simpler names. Your theme determines the font, color, and transition style of your video. PRO TIP: You can hover over the themes, and the user interface geniuses at Adobe will give you a little preview of the different ways your theme will move. So cool! You can always switch up your theme as the mood strikes you. Here’s where this program shines: you’re never locked in. You are free to experiment and try new things. After selecting a theme, you can choose the layout of your first video slide. There are four layout options to choose from: Full Screen, Split Screen, Caption, and Title and Text. 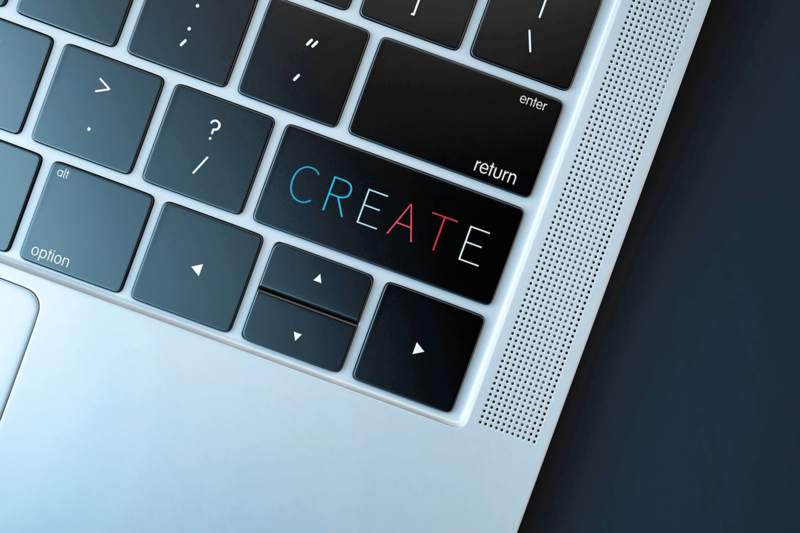 This may seem limiting to experienced video editors but if you are just dipping your toe into this world or you’re looking for a speedy content creation machine, you will find it liberating. There are no big decisions to fuss over – just choose one and go. You can always go back and try one of the others if it doesn’t flow right. Make your choice and start adding your video, text, photos, or icons. The interface feels a lot like making slide decks in Google Drive. Spark lets you upload your own shot or stock video and pictures. The software also offers a stock photo library as well as a large suite of flat style icons. You get to choose how long your “slide” appears in the video. If you are using text in your video, I suggest you time how long it takes you to read the text out loud two times – that’s the length of that slide. Once you have the look of your video where you want it, it’s time to select the audio. Spark Video has a suite of free music soundtracks for you to chose from… for free! Yes, really. They credit the composer in the auto-created credits. You can also add your own music! You can host the video on Adobe’s site, or you can download it – your choice. Now you have a cool, Facebook ad-ready video. PosterMyWall is a free online app that simplifies graphic design for marketers and businesses. They offer thousands of templates that you can customize and print for your business. Designers can contribute to the Poster My Wall community by submitting their templates for sale; therefore, there is a terrific range of offerings available. The web-quality downloads are free, but if you want to print a banner, postcard, poster, or framed art, it’s going to cost you a little. Getting started couldn’t be easier – just click “Create a Design” and you are off to the races. Poster My Wall has a massive variety of seasonal and industry-specific templates. For those getting started with design and marketing, this is a huge help. Select the template you want to edit and get down to business. The editing screen is bright and easy to understand. The left side is for adding elements, the right side is for editing the elements already on the page. The template I chose had the elements locked into place but you can easily toggle that option off. For Adobe folks, the layering functionality will feel a bit like Illustrator. The templates allow you to add your own stock and real photos from Facebook, Google Drive, and Dropbox. The text options are incredibly interesting and really speak to the use case for this software. Along with plain and fancy text options, PMW offers a text menu option that makes it easy for restaurants to lay out their dining offerings. If you want to change the text size, you scale the box down to fit the space. In the “Layout” section, you can add data tables and those tear-off tabs that are so popular with campus flyers. All text changes are click and type – easy peasy. Each color and block is ready for you to customize with your brand colors. There are also clipart and background options for you to play with. Once you’ve got your image looking great, you can download it right away. The watermark Poster My Wall places on free, web-sized images is small and unobtrusive. Seems like a small price to play for free design. If you wanted to print, the price varies by size and quality. More than five million users from 184 countries use Piktochart to create infographics and presentations. It’s easy to see why this application is so popular, they make creating infographics simple and a little – dare I say – fun! Recently Piktochart expanded their offerings into Presentations and Printable graphics but this review will focus on the infographic creator. Getting started is easy but not as frictionless as some of the other, no account-required programs. You will need to make an account or sign in with your Google account or Facebook. With the free version, you get access to nine templates, plus the option to create your own from scratch. The free template offerings are a good place to start. Brandwashing one of them will give you a better idea of what this program can do. Once your template is loaded, it’s time to play. Piktochart organizes the infographic sections into movable blocks. Each element in the block can be changed but this functionality makes it easy to organize your visuals as you go. Block controls are located on the left side of the block. Hover over any of the icons and a tooltip will tell you exactly what each thing does. No techie mumbo jumbo – just plain English. You can change the color or choose a pattern to overlay the background of the block. Piktochart even lets you play with the opacity. The lower you scale the opacity the more of your background color will shine through the pattern – making it more subtle. When you are ready to change the text, Piktochart makes it so very easy. Just click anywhere in the text box, choose your font from an extensive list of common, cute, and Google fonts. All of your usual keyboard commands like delete and CTRL + Z will work here. The text options should look familiar to you – they remind me a lot of prevalent word processing programs. You can change the color, size, justification, line height, and kerning of your text. This gives you incredible control over how your text appears. If you don’t get down that way, no worries – just leave it alone. To swap out the graphics, just click the image and delete. Many of the templates have layered images. For instance, our birthday hat folks are made up of people and the hats. You can swap out or delete either element to change your look. Just click the element, then press the delete key. On the left-hand side of the screen, go to the graphics tab to select your new visuals. You can search for icons and photos or upload your own. You won’t be able to change the colors that make up the illustrators, a definite selling point of competitor Canva. New layers, like our new people, will be put on top of the image, so you may have to move the layers around to get your elements back in the right place. You can always start from scratch. Piktochart’s downloading options are end-user centric. You can download the whole graphic as a medium quality PNG or each block individually for easy content marketing. If you want a PDF or higher quality image, you are going to need to go Pro. Piktochart is one of the most user-friendly web-based visual editing software solutions out there – a great tool to have in your graphic arsenal. Sometimes all you need is a quick quote for your company’s Instagram, Twitter, or Facebook. Man, do I have a tool for you. Pablo, a micro product developed by social media management platform Buffer, is exceptionally easy to use. You can select one of Pablo’s quote, announcement, or promotion templates or choose to do it yourself. Both are super simple to master. Choose your background image from the left side menu. Pablo has 600,000 images for you to choose from. They all have that social media perfect, dewy quality to them, and they are free – not so much as a watermark. To add your quote, click in the text box and paste or type in the text. A text menu will appear that allows you to change the font, size, justification, and text color. All changes happen live and are easily reversed. If this content needs to be branded, you can upload and place your logo on your art. One of the most exciting features Pablo offers is the ability to change the size of your quote for each social media account: tall and slim for Pinterest, square for Instagram, and rectangles for Facebook and Twitter. Then download or share on your social media and go. How easy is that? Pixlr offers two free, web-based applications for your graphic design needs – Pixlr Editor and Pixlr Express. Pixlr Editor is essentially a simplified, web-based version of Photoshop. It doesn’t have the finesse or horsepower, but it’s also free. Pixlr Express is a completely different animal. It functions like a robust app. The experience is simpler and intuitive but it lacks the control experienced designers love from Pixlr Editor. Although both are amazing for the big price of free, they are powered by Flash which feels outdated. If you are a template-driven person, the Express version will probably be a better solution for you. Pixlr Editor is the closest I’ve seen any free online editor get to the Photoshop interface. When you launch the application, you are presented with a few options on how you wish to proceed, depending on the type of project you are creating. You can create a new image or copy and paste something you have on a clipboard onto a canvas. You can browse an image you have on your computer into the editor. You can use the URL of an image from the web or open up an image from Pixlr, Facebook or your Google Drive. Neato. Once you decide what you want to work on you are presented with a canvas to begin creating your work of art but with no real guidance. If you love Photoshop but the cost of Creative Cloud is out of the budget, this is a great starter solution. If you’ve used Photoshop in the past, this should look familiar. All of your old PS favorites are there – like layers, paint bucket, red-eye reduction, clone stamp tool, and many others. There are a few, non-intrusive ads on the canvas area and on the save screens. It doesn’t have the horsepower of Adobe’s signature product but in this case, you get far more than what you pay for. If you are just looking to apply a quick fix or add a personal touch, Pixlr Express is here for you. Just like it’s older sister Editor, Express is a web-based photo editing program, but where Editor is a Photoshop-like experience, Express feels more like a robust app. When you arrive on the page, you will have four options: browse in a photo, open a photo from a URL, take a photo with your webcam, or create a collage of images. In order to show you the full suite of options available, I browsed in my favorite elephant photo and got to work. At first glance, you will see six editing options, but each has a wealth of sub-options within. The Adjustment option is the place to get your image in great shape. With just a few simple clicks, you can adjust your photo’s color, crop it, and get rid of any red eyes. If you are looking for something fancier, the Focal tool makes it easy to add a vignetted look for your photo. All the changes you make are shown live on the photo, and they don’t “stick” until you click “Apply.” It would be helpful to have some hover tooltips in place for newbies to briefly explain what each tool does. As it stands now, you will just need to experiment. You can’t lose! The Effect option brings some of your favorite photo color filters to your desktop. Within each filter heading, there are more options. Just keep clicking until you find just the right filter. The Creative option is great for product companies. You can create eye-catching collages of your products perfect for catching people as they scroll through Instagram. The Overlay options are a little silly but creation should be fun, right? Here you can quickly add patterns and effects, like fireworks, neon and retro poster looks on top of your photo. How fun! When you’ve selected an Overlay you’d like to experiment with, the swap button makes quick work of testing out all of the options under a given overlay or effect. You just pick one of the styles and click the swap button to see all of the style options in an instant. From there, the business use for this application really falls apart for me. The text options aren’t great and the borders look outdated. Canva is one of the best web-based graphic editors ever created. You can do a lot but it might cost you. Free options on the platform are becoming more limited as they push for Pro upgrades. Gravit Designer is a free vector design app. It has great functionality but a steep learning curve. Subtle Patterns is a micro product by designer marketplace Toptal. There you can grab simple patterns to give texture to your next web project. Armed with these new creative tools, you will be able to craft more quality, beautiful content. Happy creating!